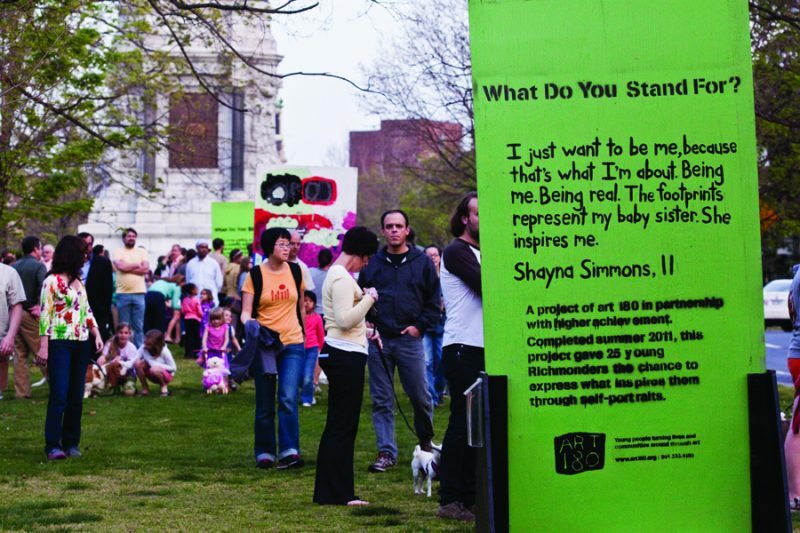 The crowd on Monument Avenue Tuesday night turned out to protest the city's decision to revoke a permit allowing the public exhibition of self-portraits by inner-city children. Hundreds of people attended a scheduled art walk Tuesday night on Monument Avenue in support of ART 180, a local organization whose exhibit has become the center of controversy in the last week. Richmonders of all ages gathered on the grassy median of the historic street to view the art of local 11- and 12-year olds as the sun set over the statues of Confederate army heroes. One of the program leaders for the “What Do You Stand For?” project, Rob Gibson is a senior communications arts major at VCU. Gibson worked with the middle school students to develop the self-portraits during a summer program last June. His portrait is one of the 30 4-by-8-foot painted plywood pannels lining the median of Monument Avenue. Gibson said he’s unsure of what to make of the controversy, but he sides with the children. “What Do You Stand For?” is a traveling exhibit of self-portraits by inner city children who particpated in a summer program with ART 180 last summer. The organization works to provide art-related programs for children who live in difficult circumstances and promote individual and community change through self-expression, according to its website. The portraits have been in the median on Monument since March 26 and were scheduled to be on display until May 4. One of the portraits went missing hours before the scheduled event. On Tuesday, the city revoked ART 180’s permit, which it originally issued, because the art violates a Richmond city code that prohibits signs in medians or public rights-of-way. Chief administrative officer Bryon C. Marshall said in a statement that it is “unfortunate” that the permit was issued mistakenly, the Richmond Times- Dispatch reported on Tuesday. Max Daniel, a graduate student in social work at VCU, attended the art walk. A Richmond native, Daniel said the city’s handling of this situation speaks to a problem of greater context. Second-district city councilman Charles R. Samuels said he doesn’t believe class or race had any part in the decision the city made to revoke the permit from ART 180. Future conflicts can be avoided if the people responsible for issuing permits have the proper training and know the city ordinances, Samuels said. The city notified ART 180 on Wednesday afternoon that the relocation of the portraits to lawns along Monument Avenue does not violate any city codes. Scott Blackwell, a board member of ART 180, said countless residents of Monument Avenue have reached out to the organization to show their support for the exhibit. “More people are seeing this exhibit than would have ever seen it. I kind of thank the few who didn’t like it because this would have never happened,” he said. The Monument Avenue Preservation Society released a statement in support of the art after a meeting Monday night. Aaron Goldberg, a resident of Monument Avenue, said the city has a responsibility to the Richmond community to handle tough situations fairly. Goldberg and his wife Stephanie are working to recruit their neighbors to host individual pieces from the exhibit in their front lawns. In a statement posted on the group’s Facebook page on Monday, executive director of ART 180 Marlene Paul said the organization is “abundantly sad” about the city’s decision to revoke the permit. A statement posted Wednesday thanked supporters for attending the art walk. “The community rallied together to celebrateand elevate a temporary public art exhibition on a street with permanent publicart that recognizes an aspect of Richmond’s history not all of its citizens choose to celebrate,” Paul said. The portraits will be on display during Sunday’s Easter on Parade on Monument Avenue, but must be removed from the median by Monday. In an email sent Wednesday afternoon, Paul said Venture Richmond would pay for the equipment and labor to move the portraits after the parade.